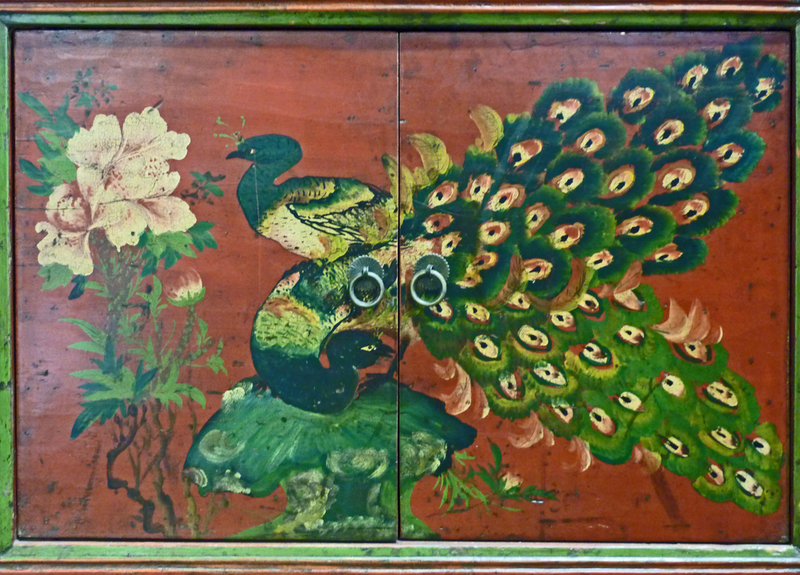 This painting is from a credenza from Gansu province. Note the peacock spreading its tail: more wealth, more status, more happiness is yet to come. The divine bird, the phoenix, is said to be formed of five elements; metal, wind, water, fire and earth. The head represents the sky; the eyes the sun; the back the moon; the wings the wind; the claws the earth; and the tail the latitude. The phoenix of often depicted in a shape like a peacock; the two are often found together. The varied colorful feathers have different features and represent various things. For example, the head feathers represent virtue; the wing feathers rites; the back righteousness; the breast feathers benevolence; and the belly faith. The bird brings peace and prosperity in its wake. The depiction of the phoenix with other symbols enlarges on the symbols inherent in the bird. For example when the phoenix turns to the sun and is bathed in the sun’s golden rays it symbolizes the approach of a happy life and a bright future. When it appears with a peony blossom riches and honors are forthcoming as well as happiness. The phoenix has been designated, along with the dragon, for use by the emperor. The union of the female phoenix and the male dragon represents a happy harmonious union.